Our Jumpstart scheme is just what the doctor ordered! Medical Writer Dr. Jennifer Hughes feared she might have to live in a rented granny flat for the rest of her life as house prices in her favourite parts of Cheshire seemed out of her reach. And with her fiancé Keith working as a self-employed plumber, they were told his earnings could not be used to help them get a mortgage. So, despite Jennifer having saved for the last ten years to buy her first home, she thought the chances of her and Keith buying more than a 'two-up, two-down' terrace were remote. Jennifer, 29, said: "With a mortgage based solely on my salary we thought we'd end up with something small in the second-hand market and not in the location we wanted. 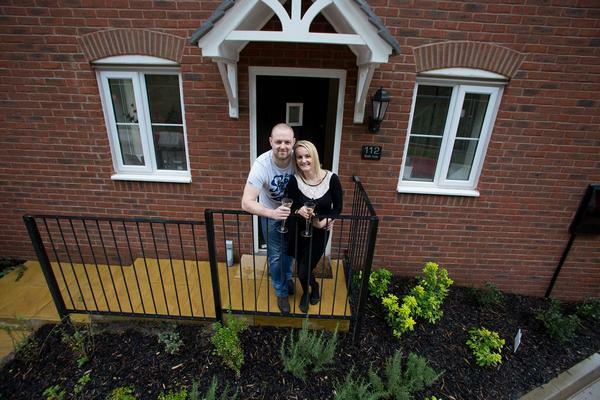 The idea of us affording a new home was a pipe dream, but I had not realised the support that Bovis Homes could give us." It was a chance remark from a friend about shared equity that prompted Jennifer to do a Google search on 'new homes Cheshire' and there she found Bovis Homes advertising its Jumpstart scheme at its Brook Valley development in Congleton - perfect for first time buyers. "It was a brilliant find for not only did Bovis Homes have some lovely homes in Congleton, which is a great location for both of us, but their Jumpstart shared equity scheme was ideal, as it meant we only needed a 5% deposit." The low-deposit requirement is just one great feature of Jumpstart, which is also available for existing home owners looking to move. The shared equity element means the buyer only needs an 80% mortgage - Bovis Homes gives a ten-year loan for the remainder - which gives the customer access to lower lending rates. Now husband and wife, life is looking rosy for the couple. "Keith now has a salaried job," said Jennifer. " As I will have opportunities for career progression the Jumpstart scheme was absolutely ideal for us because we have the option to buy the remaining percentage in stages over the next ten years." Another huge bonus of using Jumpstart for Jennifer and 32-year-old Keith was that they could afford a more spacious, three-bedroom, end-terrace home. Jennifer said: "The Padstow housetype is perfect for us. It's a much bigger house than we thought we could afford and the location is nice and quiet, but has great access to the motorway. I can get into Manchester easily to see friends and to Birmingham and London for work. It couldn't be better." Jennifer used an independent mortgage advisor and a solicitor, put forward by Bovis Homes which ensured the whole purchasing process went smoothly. "I couldn't fault anyone, we had a lot of help from all those involved and everything went to plan. I reserved this house when it was just a patch of mud and have watched it being built, stage by stage. "We've now got so much space we've not enough furniture to fill it, but that doesn't matter for now, what's important is that we have our own lovely three-bedroom home which is just what we wanted!"